I started making this Chocolate Sheet Cake recipe when I was in high school. 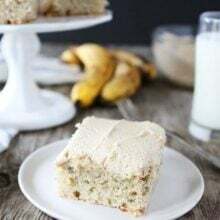 It always came in handy when I needed a dessert to take to school sports banquets or when my friends were coming over. It has been one of my “go to” cakes for years. I usually make a chocolate frosting, but I recently switched things up and made a creamy peanut butter frosting to top the cake. Best decision ever! This Chocolate Sheet Cake with Peanut Butter Frosting is my new favorite cake. I made this cake because we were having friends over for dessert. It is the perfect cake for entertaining and sharing. It is so easy to make-you probably have all of the ingredients in your kitchen right now. Hint, hint-as soon as you finish reading this post, you better get baking:) The cake is rich, chocolaty, and incredibly moist. Everything you’ve dreamed about in a chocolate cake. The peanut butter frosting really is the icing on the cake:) I like to frost the cake when it is still warm so the frosting spreads easily and melts over the chocolate cake. I also like to chop up Reese’s Peanut Butter Cups and sprinkle them generously over the peanut butter frosting. The candy adds decoration with almost no effort and ties the chocolate cake and peanut butter frosting together. 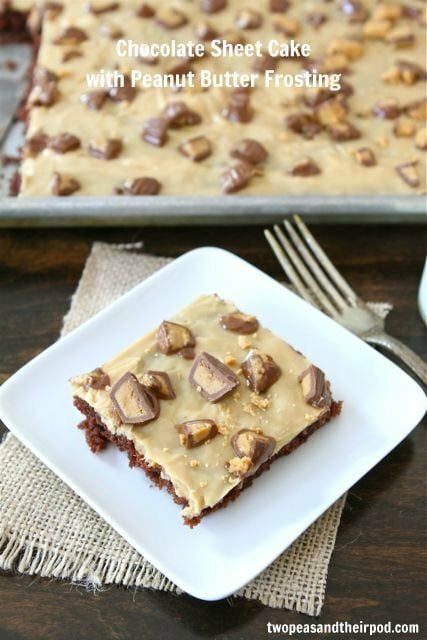 Make this Chocolate Sheet Cake with Peanut Butter Frosting…and be prepared to share! It feeds a crowd! Or you can just let the cake sit on the counter and it will magically disappear. I bet you can’t walk by without taking a bite, or two, or a gigantic piece. It is so good! 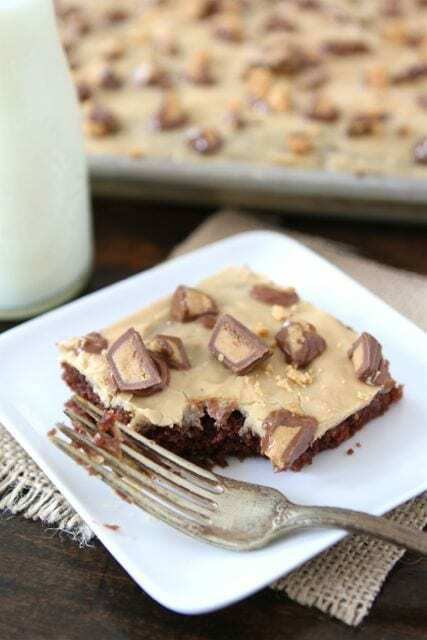 Rich chocolate sheet cake with peanut butter frosting. This easy and decadent cake will feed a crowd. To make the sheet cake: Preheat oven to 350 degrees. Grease a sheet pan with cooking spray and set aside. I use an 11 x 17 jelly roll pan. In a large mixing bowl, whisk together sugar, flour, baking soda, and salt. In a separate bowl, whisk together eggs, buttermilk, and vanilla extract. Set aside. In a small sauce pan, melt the butter on medium-low heat. Whisk in the cocoa powder and hot water. Turn up the heat to medium-high and bring the mixture to a boil. Add the melted butter mixture to the dry ingredients and mix until smooth. Stir in the egg mixture and mix until ingredients are combined. While the cake is baking, make the peanut butter frosting. 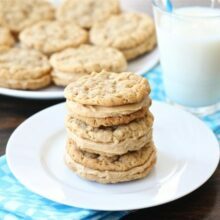 In the bowl of a stand mixer, combine the sifted powdered sugar, milk, peanut butter, and vanilla extract. Beat with the beater blade until smooth. Frost the chocolate sheet cake after the cake has cooled. Sprinkle chopped up Reese's Peanut Butter Cups over the frosting, if desired. Let the frosted cake cool to room temperature. Cut into squares and serve. How did you know that I have been searching all over the place for “the perfect” chocolate cake recipe the past few weeks. I have read so many. Everyone has a different version; buttermilk, cream, coffee, butter, oil, cocoa powder, melted choc chips, etc. Thanks for sharing YOUR go-to cake that you’ve had since h.s.! Thanks so much for sharing this recipe, love this! Looks so good! Pinning! This sounds so fabulous! I love that frosting! I am really liking this cake! I’m not sure what’s not to love! I like that it feeds a crowd, it’s nice to have a go to for gatherings. I’ll be keeping this one! Oh my gosh, it looks so delicious!!! PB frosting, ohhhhhh!!! I need to have a party just so I can serve sheet cake. Can never go wrong with chocolate and peanut butter! I am in love with the look of that frosting!! Such a perfect cake for cook outs or family get togethers!! oh yeah, my hubby is allergic to peanut butter too, so this is all mine if I make it. You cannot go wrong with peanut butter & chocolate, what a pretty cake!! Are you kidding me?!?! Wow!!!! This looks incredible! My 2 favorite things together!! I will definitely try this!! Peanut butter + chocolate = pure awesomeness! I probably wouldn’t be able to shovel this into my face fast enough! I love that the cake is so thin! I think it makes it so fun for kids! Great idea! 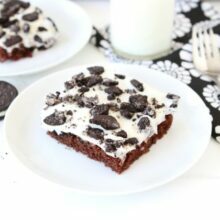 Such a delicious looking sheet cake!! This looks yummy! I love this cake recipe and who can resist pb frosting. One question regarding pan size -is 11×7 correct or were you referring to 11×17? Thanks so much for catching my typo! It is an 11×17 sheet pan! It makes a big cake:) I updated the post! This is my kind of cake!! PB frosting is the best!! Mmm peanut butter frosting…doesn’t get much better than that. Pinning! Oh boy, I think I just gained 10 pounds looking at this cake! It looks delicious!! Yum! This cake looks amazing. The only ingredient I’m missing is buttermilk, but I guess I could whip up my own 🙂 The peanut butter cups on top look like the ones from Trader Joe’s! Those are soooo good. Salt Lake doesn’t have a TJ’s but they’re getting one this fall! I have always adored chocolate sheet cake. The PB frosting is a perfect addition! Oh YUM. I would definitely have a problem taking nibbles of this cake! My boys would love this- choc+peanut butter always a winning combo! Oh yum! I haven’t had sheet cake in forever. It used to be a staple growing up. I love the peanut butter frosting! The peanut butter cup garnish really takes this to the next level! I seriously want a piece of this right now! We have a birthday next week (Pea Daddy) and I am hoping I can somehow implant in his head that he wants this cake. I’ll be making this for the next party/get-together I attend! Hi-thank you for your kind comment. We do have a print option. On the recipe, right below the little photo, there is a printer icon. Click on that. I hope that helps! This looks to die for! The cake is on my “MUST” list for the fourth of July! I love chocolate & peanut butter together and this cake looks to die for!!! There’s no way this cake would even survive long enough to be served to friends. Into my belly it would go! You so know the way to my heart! Chocolate + peanut butter. Loving this sheet cake right now. Yum! This combination is a wonder! Loving this! You`re tempting me wayyy too much! This sounds like the perfect go-to dessert, Maria. And let me tell you, the Reese’s PB cups wouldn’t be optional in this house! YUM! 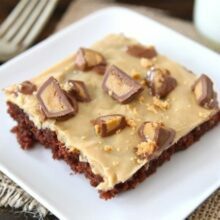 I love a good classic sheet cake, and with those peanut butter cups on top this looks to die for!! you’re talking my language right here! I will literally put peanut butter frosting on anything! Apples? Yes. Pancakes? Yes. Chicken salad? Umm… probably. I love large sheet cakes like this. And pb and chocolate…yes, please! Oh Maria this looks AMAZING! This looks like pure bliss! 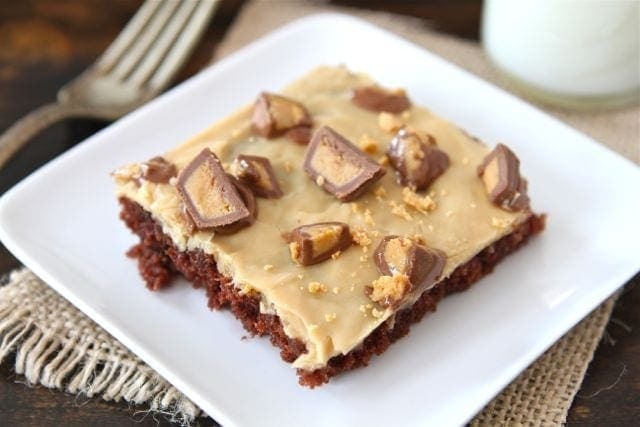 What a fantastic combination and I love that you even topped it off with peanut butter cups! This cake looks delicious! Do you have the recipe for the chocolate frosting that you have used in the past for this cake? My sister’s birthday is coming up and she loves tofee. I think this cake with chocolate icing and chopped up Heath bars would make her very happy!!!! I’d like to set a timer to see how long this cake would last at our house! Yum!! Ive made this today for my sproglets for the weekend and they love it! Thank you for another great recipe! Woah… you are amazingly talented at making irresistible treats! This cake looks amazing, it has my name written all of over it! I have also made a chocolate sheet cake for years. Always a favorite everywhere I take it. I have never thought to make a peanut butter frosting. What a great idea. Can’t wait to try it! This was soo good! I made it in 2-11 x 7 inch pans as I wanted to bring a pan to work, and save one for my husband and kids at home. Everyone loved it! The peanut butter frosting was out of this world good! Definitely will make this one again. This was fantastic! My husband loves chocolate and peanut butter so this was the ultimate birthday cake for him. Thanks for the great recipe! I made this cake last night and it was fantastic! I brought some into my coworkers and they have all been raving about it. I did top mine with Reese Cups but used the Dark Chocolate ones instead of regular. Next time I would probably make some more frosting for the top, but otherwise the combination of chocolate and peanut butter was great, plus this was quick and easy to make! Thanks for sharing this recipe! With a few simple substitutions I was able to make this for my daughter with dairy allergies. This was the first recipe that I have found that tastes amazing with the substitutions (I made it both ways). I now have a recipe that I can make for her birthday-THANK YOU!!! Last weekend I was trying to find something ‘creative’ to bake. I made a choclate cake and chocolate buttercream frosting, cut the cake in half to fill it with the frosting, put it in the freezer for about an hour to firm up the frosting, then poured Smuckers Caramel sauce over the center of the cake and put the top on, froze it again for about an hour to firm up the caramel then frosted the entire cake with the rest of the chocolate buttercream frosting. DELICIOUS!! In continuing my search for the ‘perfect’ cake, I baked another chocolate cake and made more chocolate buttercream frosting, cut it in half, whipped up a cheesecake and poured that over the bottom half and then poured strawberry preserves over the cheesecake, put the top on and frosted the entire cake with a chocolate mousse frosting. OUTSTANDING!! Well then I wanted to try something w/peanut butter so I baked another chocolate cake, cut it in half and layered the bottom half with peanut butter straight from the jar and poured hot fudge straight from the jar over the peanut butter (I didn’t heat the fudge, just poured it from the jar straight from the fridge). The feedback wasn’t as good in that everyone said all you can taste is the peanut butter and an after taste of the fudge and they needed 1/2 glass of milk to wash down one bite. I thought…back to the drawing board. So I did a little research and badda bing…badda boom…here you are!! Thank you so much for sharing. I’m looking forward to trying your recipe!! THANK YOU! I made this cake over the weekend and got rave reviews from indulging friends. I couldn’t believe such a simple icing recipe could put out so much flavor! 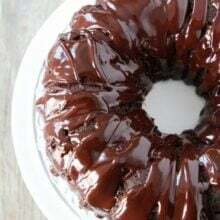 Just a tip in case you let your cake cool before applying the icing: If you microwave the icing for about a minute and stir, it’ll be soft enough pour over the cake without ruining the consistency or flavor. Also, as much as I stand by “from scratch” recipes, subbing with a chocolate cake mix can cut prep time significantly if you need dessert with little time to make it. Haven’t made the cake yet, but we did make the frosting! Best peanut butter frosting that I may have EVER had. Definitely a go to!! To die for! Thanks for sharing this! I made this exactly as you wrote… IT WAS AMAZINGLY GOOD! Thank you for sharing it! It took me all day though, but worth it. I had featured u in the post of Here Are Seven New Ways To Make Romantic Chocolate Cakes For Fathers on AllFreshRecipes.Except ur more Eats! It’s my son’s 50th Birthday and I have been making him cakes for his Birthday every year. I know he will love this cake! This looks so yummy! I may make this for my husband for Father’s Day. What do you do with your leftover buttermilk? I don’t use it on a regular basis, so it’s tough to justify needing only half a cup and not using the rest of the container. Thanks!